In 2003 Strelets began producing sets that included one figure which was unrelated to the subject of the set. The figure was of a member of the Streltsi from the late 17th century, and as each set is acquired so a complete collection of Streltsi is built up. It is not currently known how many such figures will eventually be made, so this page is concerned with those figures already in production. By it's nature therefore this page will change and be updated each time a new figure appears, and as of the latest update (in early 2018) there are an impressive 71 different poses, with no sign of the supply drying up. In the 1690s the nearest thing Russia had to a standing army were the Streltsi (literally 'musketeers'). They liked to consider themselves an elite, and tended to act like a praetorian guard, getting involved in political intrigues and enjoying their power without adequately maintaining their military effectiveness. When Peter the Great (1672-1725) became sole Tsar in 1689 he embarked on a radical series of reforms to transform his inward-looking feudal state into what was to become a major European power, and many of these concerned the army. In 1698 the naturally conservative Streltsi, who felt threatened by the 'new ways', rebelled. Peter savagely suppressed the rebellion and disbanded many of the regiments, incorporating the rest into his new army. The Streltsi were dressed in the traditional Russian long coat (kaftan) and had fur-trimmed hats. They wore beards, another Russian tradition, and carried a match-lock musket, sword (shashka) and battle-axe (berdysh) which also served as a musket rest. The figures here reflect this appearance accurately, including the musketeer using his berdysh as a rest. Figure 2 carries a device that can be either a halberd or a large axe, with either the axe head or the spike being trimmed off as required, though this man is missing a sword. The musket on figure 3 is rather too thick and short for our liking, but the officer figure (4) is quite nice, with only a passing resemblance to Santa Claus! We also particularly liked all the musicians, who are well done considering the difficulties of the subjects. Figures 22 and 42 look to be very senior officers, and could also pass as boyers or other nobility in the old Russia, and again both are splendid figures. Figures 4, 27, 29 and 46 all look to be officers of various ranks, the last holding a partizan well out to his side. As the collection grew, Strelets started straying from the path of Streltsi and began delivering related figures, something very unlikely to be seen in any normal set. Figure 44 is particularly interesting as he is a member of the Rynda, an honourary bodyguard of the Tsar made up of young men chosen from the nobility. This figure correctly has a kaftan trimmed with ermine, a silk sash, gold chains worn round the body and a tall fur gorlatnaya, which was a boyar hat, and so like the rest of the costume emphasised their seniority. He carries a large axe, again primarily a status symbol, though as a palace guard they never went into battle. Figure 45 is a sokolnichi, basically a servant who trained hawks for the Tsar's hunt; here he handles a bird which, like the figure itself, has been very well done. The detail on the figures is OK, but the quality of the sculpting varies from pretty good to quite poor, although there is no apparent flash. The differences in sculpting quality are down to the fact that they originate from many different sets, with different sculptors and production histories. For example it is noticeable that figures 9 and 10 are much less well defined. This is due to problems with making the mould on the corresponding sets, but it means they compare unfavourably with the earlier figures (6 to 8) shown on the same line. This is something of a commentary on the history of Strelets sculpting over the years, since the figures above are numbered more or less in the order they were produced. Although all are of a similar style and match each other well, it is clear that more recent examples are somewhat better than some of the early efforts. The contrast between figure 54 (a glorious sculpt) and figure 55 (quite a mess) is particularly striking, especially as both were produced at a similar time, although clearly by a different hand. This is an interesting subject, and an intriguing method of delivering the figures. Since the company took its name from this unit it is only fitting that each set should include a representative from it, and over the years a large and diverse set could be constructed which is free from many of the limitations of the traditional one box approach. 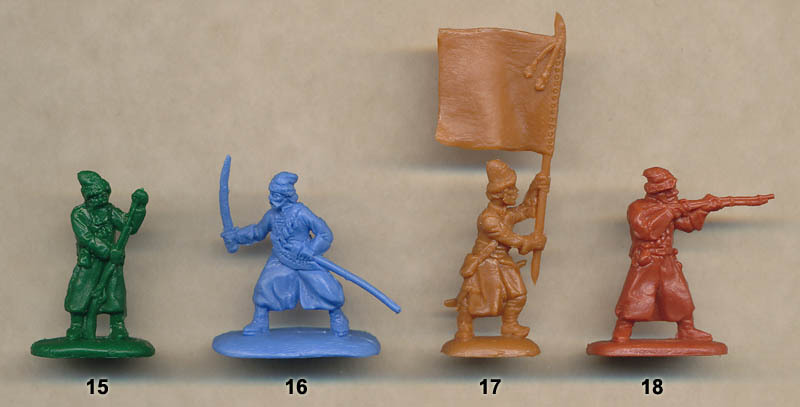 However for those that cannot wait Zvezda have produced a box of these figures which match these Strelets figures in terms of unit and time period. Take a look at the review for details.